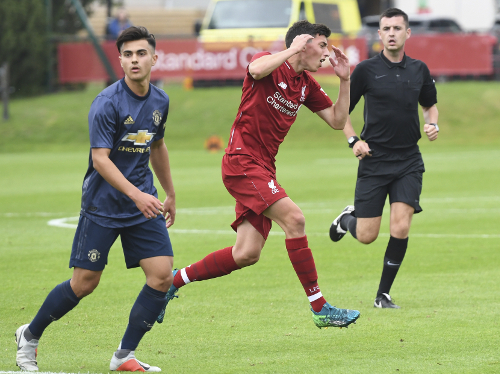 Liverpool U18s' first home game of the season ended in a 3-1 defeat by Manchester United at the Academy on Saturday. Barry Lewtas’ side had the better opportunities before the interval in Kirkby, with new midfielder Matteo Ritaccio smacking one shot against the post and another narrowly wide. But the visitors took control of the U18 Premier League contest from then on and moved ahead through goals from Di’Shon Bernard and Mason Greenwood. Paul Glatzel halved the hosts’ arrears with 20 minutes left but an immediate red card for Abdi Sharif left Liverpool short in the finale and James Garner rolled in a 95th-minute penalty for United, for whom Brandon Williams was also sent off. The first clear sight of goal came to Liverpool’s Rhys Williams, a scorer in last weekend’s 6-1 victory at Sunderland, on eight minutes. Jake Cain picked out his teammate with an excellent curled cross from the right channel but, having climbed above his marker, the No.4 sent the header too high to cause concern. United’s goalkeeper would have been beaten seconds later, however, only for luck to go against the home team. Ritaccio won possession in the middle of the pitch and carried the ball forward waiting for options either side of him. When none quite materialised, he chose to shoot instead – and his well-struck drive from distance thudded off the right post and away. The visitors were not flustered and set about threatening the Reds consistently from wide areas, though without seriously troubling home ‘keeper Vitezslav Jaros. Indeed, it was Ritaccio who next went close midway through the half. The New York-born midfielder was the recipient of a loose ball when United cleared away a short corner routine and his sliced effort from 20 yards swerved inches wide of the left post. Glatzel aimed for the same corner of the goal just after the half-hour, fed by strike partner Bobby Duncan across the box, but the shot took a deflection before being firmly palmed out by Alex Fojticek. And momentum swung in United’s favour from the outset of the second half. Two minutes after the restart, Arnau Puigmal’s lofted corner in from the right was met emphatically by Bernard, who guided an unstoppable header back over Jaros for the breakthrough. Liverpool almost levelled quickly through Glatzel but the forward’s back header after a Neco Williams cross caused a scramble was cleared off the line by Ethan Laird. 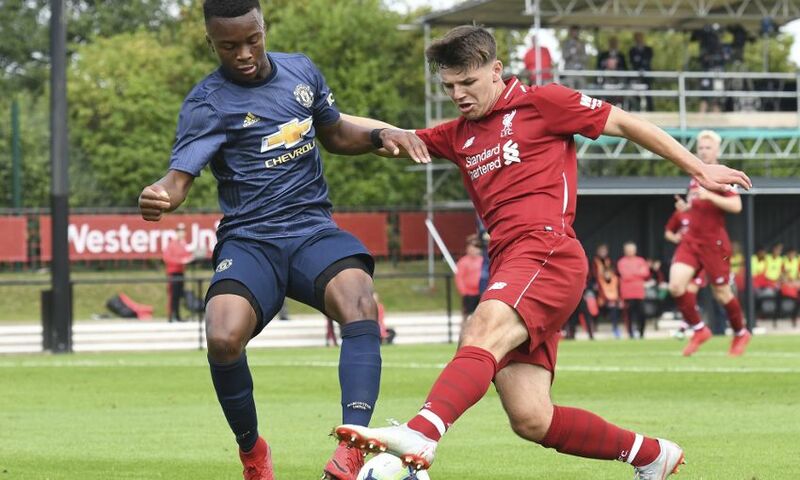 The Reds’ challenge was increased further before the hour, when a sweeping move by the away team released Aliou Traore to the byline to pull back for Greenwood to easily convert a second. Lewtas’ charges kept going and the introduction of Leighton Clarkson proved effective. It was his pressing high up the pitch that led to their goal, with Duncan capitalising to slide an assist through to Glatzel, who clipped an excellent finish across the oncoming Fojticek. The Liverpool goalscorer almost turned provider two minutes later, calmly controlling a ball into the box and turning it into the run of Neco Williams, but the full-back’s low drive was saved. Their hopes of completing a comeback were diminished in the aftermath of that chance as Sharif received a second yellow card and was sent off. The game became increasingly stretched as time elapsed, with pressure at both ends, and parity was restored in terms of numbers when Brandon Williams was shown a straight red for a lunge on Neco Williams. But the final say went to United in the fifth minute of stoppage-time. Garner tumbled under a challenge from Clarkson as he tried to dribble inside the box and stepped up himself to send Jaros the wrong way and sign off an eventful clash. Liverpool U18s: Jaros, N. Williams, Larouci (O’Rourke, 84), R. Williams, Clayton, Ritaccio (Dixon-Bonner, 55), Sharif, Cain, Glatzel, Duncan, Longstaff (Clarkson, 65). Unused substitutes: B. Williams, Brookwell.